SAN DIEGO. 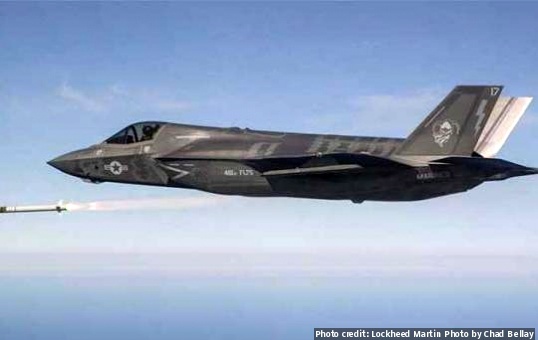 Lockheed Martin officials selected Cubic Global Defense -- a Cubic Corp. business unit -- to deliver its Air Combat Training System (ACTS) for the F-35 Lightning II. Cubic is scheduled to deliver more than 500 F-35 Training Subsystems over the next four years as part of Lockheed Martin’s F-35 production Lots 12-14. The ACTS for the F-35 includes the P5 Combat Training System (P5CTS) Internal Subsystem configuration (IS) and the P5 ground software. P5CTS is a pod solution that relays Time, Space and Position in Information (TSPI) between participating aircraft during training sorties. P5CTS enables real-time, live monitoring and recorded mission data of air-to-air, air-to-ground and surface-to-air training scenarios for post mission analysis. However, unlike the previous wing-mounted P5 pods, the Internal Subsystem in the F-35 is placed inside the aircraft. The F-35 Training Subsystems to be delivered in Lots 12-14 will add onto more than 500 low-rate initial production (LRIP) units that will have been delivered by Cubic prior to the start of Lot 12 production. Cubic and its principal subcontractor, Leonardo DRS, will continue to produce and maintain the embedded P5 solution for the F-35 Internal Training Subsystem. The Leonardo DRS Airborne and Intelligence Systems business division is responsible for the design and production of the airborne P5CTS Internal Subsystem. Engineering work for the ground systems will be performed in San Diego, California, while the airborne systems will be performed in Fort Walton Beach, Florida.